Oliver Wolcott, as much a soldier as a politician, helped convert the concept of independence into reality on the battlefield. He also occupied many local, provincial, and State offices, including the governorship. One of his five children, Oliver, also held that position and became U.S. Secretary of the Treasury. Wolcott was the youngest son in a family of 15. Sired by Roger Wolcott, a leading Connecticut politician, he was born in 1726 at Windsor (present South Windsor), Conn. In 1747, just graduated from Yale College at the top of his class, he began his military career. As a militia captain during King George's War (1740-48), he accompanied an unsuccessful British expedition against the French in New France. Back home, he studied medicine for a time with his brother before deciding to turn to law. In 1751, when Litchfield County was organized, Wolcott moved about 30 miles westward to the town of Litchfield and immediately took over the first of a long string of county and State offices: county sheriff (1751-71); member of the lower house (1764, 1767-68, and 1770) and upper house (1771-86) of the colonial and State legislatures; and probate (1772-81) and county (1774-78) judge. By 1774 he had risen to the rank of colonel in the militia. The next spring, the legislature named him as a commissary for Connecticut troops and in the summer the Continental Congress designated him as a commissioner of Indian affairs for the northern department. In that capacity he attended a conference that year with the Iroquois (Six Nations) at Albany, N.Y., that temporarily gained their neutrality in the war. Before the year was out, he also aided in arbitrating land disputes between Pennsylvania and Connecticut and New York and Vermont. 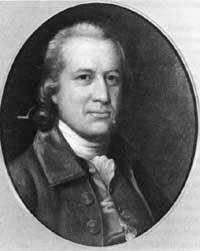 Wolcott sat in Congress from 1775 until 1783 except for the year 1779. In June 1776 illness caused him to return to Connecticut. Absent at the time of the voting for independence the next month and at the formal signing of the Declaration in August, he added his signature sometime after his return to Congress in October. Throughout his tour, Wolcott devoted portions of each year to militia duty, highlighted by participation as a brigadier general in the New York campaigns of 1776-77 that culminated in the surrender of Gen. John Burgoyne in October of the latter year at Saratoga (Schuylerville). During 1779, as a major general, Wolcott defended the Connecticut seacoast against the raids of William Tryon, Royal Governor of New York. Wolcott's postwar career was varied. On the national level, he helped negotiate two Indian treaties: the Second Treaty of Fort Stanwix, N.Y. (1784), in which the Iroquois ceded to the United States some of their lands in New York and Pennsylvania; and another (1789) with the Wyandottes, who gave up their tract in the Western Reserve, in present Ohio. On the State level, Wolcott continued his long period of service in the upper house of the legislature (ended 1786); enjoyed a lengthy stint as Lieutenant Governor (1787-96); attended the convention (1788) that ratified the U.S. Constitution; and, like his father before him and his son after him, held the office of Governor (1796-97). While occupying the latter position, Wolcott died, aged 71, at East Windsor. His remains rest in the East Cemetery at Litchfield. Drawing: Oil, 1873, by James R. Lambdin, after Ralph Earl (Earle), Independence National Historical Park.